Chief Justice John Roberts is considering whether the Supreme Court should adopt its own ethics code. The justices in practice follow a set of rules, but there is no institutionalized process that binds the Court. The justices also discussed televising their proceedings and President Donald Trump’s quarrelsome relationship with the judiciary. Chief Justice John Roberts is considering whether the Supreme Court should adopt its own ethics code, Justice Elena Kagan said Thursday. Kagan, who testified before a House Appropriations Subcommittee on Financial Services and General Government Thursday afternoon with Justice Samuel Alito, made the disclosure in response to questions about sexual misconduct in the judiciary. Alito and Kagan sit on the high court’s budget committee, and a congressional appropriation for the Court’s business was the official reason for their testimony. Thursday’s hearing was the first such proceeding since 2015. Though the Supreme Court justices follow the Code of Conduct for U.S. Judges, they are not formally bound by it. As such, there is no existing mechanism to investigate or discipline a sitting justice for ethical infractions. For example, a deluge of misconduct complaints were filed with the U.S. Court of Appeals for the D.C. Circuit during Justice Brett Kavanaugh’s contentious confirmation, but they were dismissed in December 2018 in view of his elevation to the high court. Alito told the panel that applying the Code of Conduct against the high court raises thorny constitutional issues. On the other hand, a set of rules promulgated by the Court itself could be less problematic. Elsewhere in the hearing, Alito and Kagan shared their opposition to filming the Supreme Court’s proceedings. Current practice provides that a transcript of arguments is released on the same day as the proceeding, while an audio recording of the argument is released at the end of the week. Alito said he supported efforts to make the high court’s proceedings more accessible to the public, consistent with their ability to decide cases effectively. As a circuit court judge, he voted in favor of introducing cameras to the 3rd U.S. Circuit Court of Appeals. However, his thinking changed after his confirmation to the Supreme Court. “I came to see that allowing the arguments to be televised would undermine their value to us as a step in the decision-making process,” Alito told the panel. Kagan expounded on that point, saying that oral argument is especially useful because it gives the justices a chance to engage in a free, searching, and sometimes colorful analysis of the case before them. Were cameras introduced, Kagan said, the justices might begin to censor themselves and avoid questions the public could perceive as strange or inappropriate. “I challenge people in ways that might sound as though I have views on things that I in fact do not, just because that’s the best way of really understanding the pros and cons of a case,” Kagan added. She went on to say that the justices have not discussed the matter as a Court since her confirmation in 2010. Fix the Court, a nonpartisan watchdog that advocates for increased transparency at the high court, detected a bit of irony. “It’s a bit disingenuous for Justices Alito and Kagan to state calmly, in front of several video cameras and a dais full of attorneys, that cameras in their courtroom would somehow impact the tone of their hearings, especially since concerns over grandstanding haven’t proven true in other appeals courts that do allow video,” said Fix the Court’s executive director Gabe Roth. Alito noted that technology has greatly improved public access to the judiciary. The Supreme Court introduced e-filing, and makes its opinions available on its website at no charge. In recent decades, those resources were only available at public libraries with a special subscription service and copies of the U.S. Reports, a reference volume that contains Supreme Court decisions. 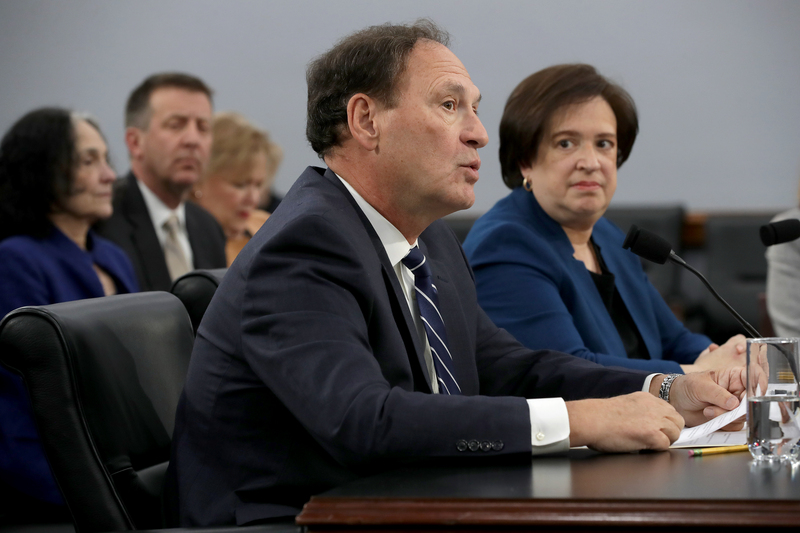 Pressed at another juncture of the hearing about President Donald Trump’s pugnacious rhetoric about the judiciary, Alito emphasized the importance of precision and respect in dealings between the three branches of government. “I think it is extremely important for all the other members of all three branches to be accurate and respectful when talking about the members of the other branches,” Alito said, while emphasizing that he was not directing his remarks toward any particular person or instance. Chief Justice John Roberts rebuked the president after he derided a judge who thwarted his new asylum rules. The hearing began on a light note, when Alito accidentally knocked over a glass of water, which shattered. The justice said he was off to an ignominious start, especially since he was representing the Court before Congress for the first time. Justices Anthony Kennedy and Stephen Breyer sat on the Court’s budget committee in the past and appeared before the Appropriations Committee on prior occasions. “We are rookies, and I’m sure when I get back to the Court I will hear immediately from Justice Kennedy and Justice Breyer that in all the times they appeared here they never broke a glass or spilled water,” Alito joked.